ExxonMobil Corporation and the College of Engineering are working together to encourage and assist talented minority students in earning degrees in engineering and pursuing STEM careers (i.e., careers in science, technology, engineering and math). The ExxonMobil Scholars program, a mentorship-centered approach to career preparation, provides students from underrepresented groups access to a network of industry professionals who are committed to ensuring the students’ time at LSU is a success. In response to the success of the scholars program, ExxonMobil has reaffirmed its commitment to promoting diversity in STEM with a gift of $250,000, bringing the company’s total contribution to the program to $750,000. 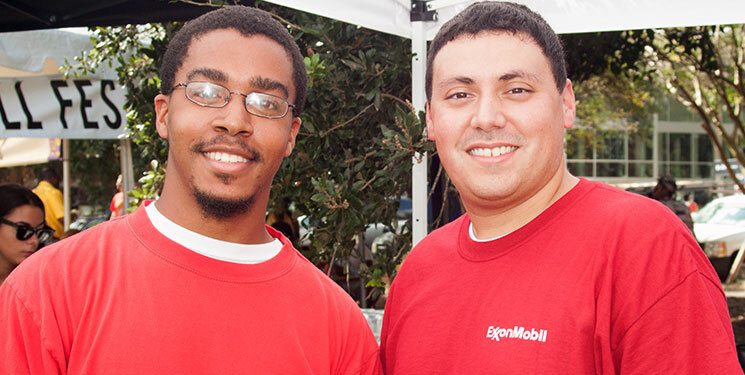 This year, African-American and Hispanic engineering students with aspirations toward STEM careers have joined the next class of ExxonMobil Scholars. Scholars like David Jordan, a junior in mechanical engineering, benefit from both financial support and ongoing one-on-one mentorship from employees. Scholars consistently identify the mentor-protégé relationship as key to their success at LSU, and they welcome the opportunity to give back once they embark on professional careers. ExxonMobil also contributes to professional and personal development programs and events in the college to help the scholars gain a better understanding of skills used by engineering professionals. “The ExxonMobil interviewing seminar provided me with a lot of useful information about the interviewing process, résumé writing, as well as techniques for a successful interview,” Jordan shared. Scholars are selected based on a proven superior academic background, early engineering or science exposure, and participation in leadership and community outreach efforts. Preference is given to African-American, Hispanic and Native American students. To remain in the program, scholars must maintain a minimum 3.0 GPA. Last year, thanks in part to academic and career development support, the ExxonMobil Scholars program had an 81 percent retention rate and an average cumulative GPA of 3.5. Several participating students hold leadership positions as engineering organization officers and members of nationally competitive teams. Since its inception in 2003, the ExxonMobil Scholar program has mentored 24 LSU College of Engineering graduates. Five former scholars became full-time employees at ExxonMobil. During the 2013-14 academic year, there were eight active scholars, including two who are participating in cooperative education experiences, with one at ExxonMobil.